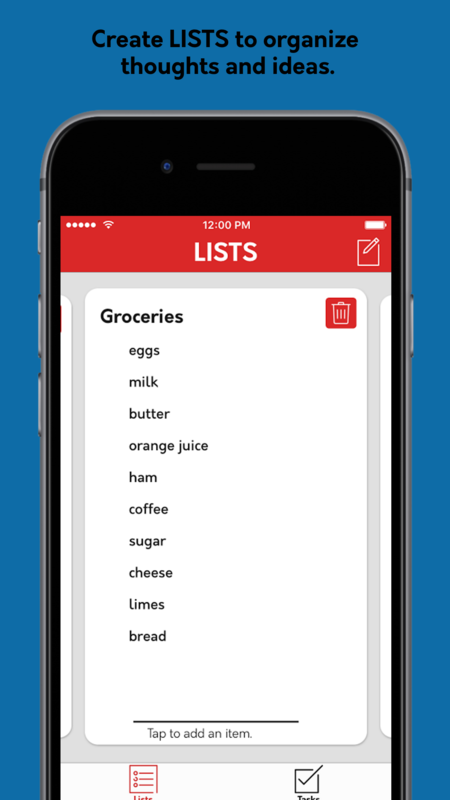 [prMac.com] Plano, Texas - Independent developer, Luis Gonzalez is pleased to announce the release of Jot: The Simple List and Task Manager 1.1 for iPhone and iPad. Jot aims to be a simple yet robust solution to a productivity market that is overcrowded with applications that are bogged down by their attempt to do too much. When a tool promises to streamline hectic thoughts and schedules, it is important the app is not slowed down by its interface and excessive features. Therefore, Jot was designed to look beautiful and be easy to use by sticking to the bare necessities expected of a list and task manager while continuing to be a powerful tool to boost productivity. Jot's easy to maintain LISTS help sort one's thoughts and ideas in a simple, appealing way in order to stay organized day in and day out. Through the simple yet powerful TASK manager, Jot provides a quick and painless way to stay on top of daily events so that productivity doesn't suffer. With single, daily, weekly, and monthly REMINDERS built into Jot, it is easy to make sure tasks get completed on time without ever having to leave the app. Jot's striking minimal interface makes keeping an organized life easier than ever before by taking the hassle out of streamlining one's schedule. Jot: The Simple List and Task Manager started with a vision for an intuitive and uncluttered way to keep track of of the many thoughts and to-dos of the day and week. While the App Store contains many great apps, it lacked a simple, stripped down tool that could be used to jot down any number of lists or items while also keeping track and reminding one of tasks that needed to be completed. This is where Jot comes in; it combines multiple apps into one and makes for the most efficient way to keep track of daily events and hectic thoughts. As long as you have your phone with you, your thoughts and to-dos are always right in your pocket. Jot: The Simple List and Task Manager 1.1 costs $1.99 (USD) and is available worldwide exclusively through the Apple App Store in the Productivity category. For more information, please contact Luis Gonzalez. Luis Gonzalez is a student at the Georgia Institute of Technology and has been developing apps for the Apple and Google Play platforms for the past three years, yet Jot: The Simple List and Task Manager is his first entrance into the market with a product that is not a game. Luis is committed to delivering simple yet useful and fun experiences in everything that he builds be it through the first iteration or many updates later. All Material and Software (C) Copyright 2017 Luis Gonzalez. All Rights Reserved. Apple, the Apple logo, iPhone, iPod and iPad are registered trademarks of Apple Inc. in the U.S. and/or other countries. Other trademarks and registered trademarks may be the property of their respective owners.